All hedgehog pet owners want a well-socialized hedgehog, but the term “well socialized” can have different meanings and contexts. Most hedgehog enthusiasts consider a socialized hedgehog to be one that uncurls, relaxes its spines, and generally appears to enjoy being handled. How a hedgehog gets to this point and stays well socialized can have many variables. Hedgehogs are, typically, naturally shy creatures that tend to fear the unknown but once they are comfortable in their surroundings they are quite inquisitive and curious. Their poor eyesight but heightened sense of hearing, motion detection, and emotion detection makes them sensitive to their environment and how they are handled. When a hedgehog is nervous or scared it will ball up and use its spines not as a form of aggression but as a form of protection. You must prove yourself trustworthy before a hedgehog will completely relax with you. Hedgehogs have a strong sense of emotion detection. 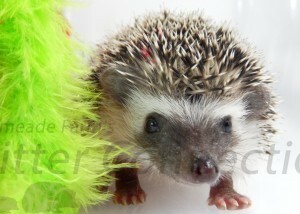 Your hedgehog will be scared and nervous during handling if YOU are scared or nervous. This is one of the main reasons why hedgehogs may not be the right pet for every person. Hedgehogs with health issues may also be less responsive to handling. An uncomfortable or sick animal may rather be left alone. Quilling is an example of a normal process that can be very uncomfortable for a hedgehog and can impact how the hedgehog prefers to be handled. Proper handling is critical to a well-socialized hedgehog. It is probably the most important factor in whether or not a hedgehog will make a good pet. Hedgehog owners need to learn to understand a hedgehog’s subtle ways of communication and behavior and then respond accordingly. What can cause a hedgehog to be scared or nervous? No matter how much socialization a hedgehog has before it leaves a breeder’s home, a hedgehog will not maintain its comfort with humans if the new owner does not do his or her part. Bonding is also an important part of the socialization process and will occur over time. Patience is probably the most important new pet owner virtue in hedgehog socialization. Our 10 plus years of experience has led us to believe that more time spent with an animal does not always equal a better response from an animal. Your actions (quality time) tend to make a larger impact on an animal than the amount of time (quantity time) you spend with that animal. Certainly the amount of time with an animal is important, but what you do with the animal during that time is far more important. You can handle a hedgehog the wrong way for a long time and get nowhere in the bonding or socialization process. Hedgehogs may learn that when they poke, you are afraid and they will continue to use this defense mechanism when they do not want to be handled. However, handling your pet the right way and responding to its needs will dramatically speed up the bonding and socialization processes. Every hedgehog owner wants a friendly, outgoing, and well-socialized pet. As previously discussed, socialization greatly depends on how a hedgehog is handled. A good breeder will show you how to work with and handle all types of hedgehogs. Proper handling of your hedgehog before it goes home with you plays a role in how your hedgehog will socialize and bond with you at your home. A hedgehog that has been poked and prodded at in a pet store is unlikely to be as good a pet as one that has been properly handled and cared for by a good breeder. Our Purchasing a Hedgehog articles outline ways that you can ensure that you get off to a good start with your new pet. Education you receive at time of purchase. Once you have selected and purchased your new pet, it is up to YOU to continue the socialization and bonding processes.